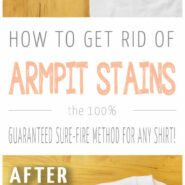 Home > Cleaning > Cleaning Tips > How To Remove Yellow Sweat Stains From Your Clothes The Easy Way! This is a sponsored post by the maker of ARM & HAMMER™ Super Washing Soda. I received compensation for this campaign but the opinions are 100% my own. When it comes to doing laundry, finding yellow sweat stains in the armpits of your shirts is a pretty common problem. And unfortunately, the stains don’t usually just come out when you do a regular load of laundry. But, there is a way to clean those armpit stains, and all you need are a few simple ingredients you can get at your local grocery store! Today I’m going to share with you my miracle underarm stain remover recipe and show you how to remove yellow sweat stains from your clothes. The secret ingredient in this recipe is ARM & HAMMER™ Super Washing Soda; it’s an all natural, super powerful cleaning agent and laundry booster, and we use it all the time! 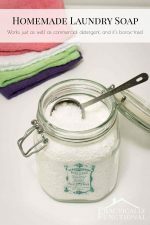 It’s great for tough laundry stains, but it’s also a really awesome general household cleaner that you can use in the kitchen, bathroom, or anywhere in your home. Check out all the ways you can use it here. If you want to try it out, you can save $.75 on ARM & HAMMER™ Super Washing Soda and other great products at your local store or retailer by grabbing a coupon here. My husband’s undershirts have the worst armpit stains on them; it’s gotten so bad recently that he can’t even wear the shirts anymore because they’re so discolored! Here’s what his shirts looked like before. The photo doesn’t even really do it justice…it’s bad! 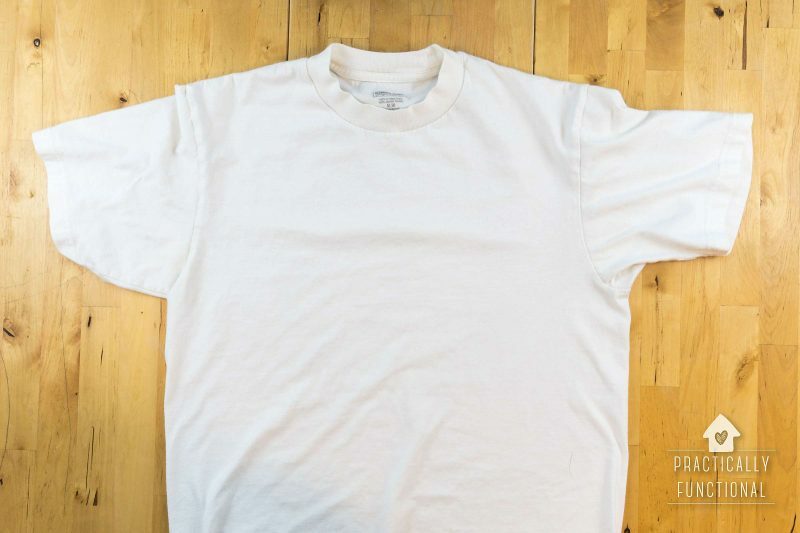 To remove yellow sweat stains from your shirt(s), start by mixing together the Super Washing Soda, hydrogen peroxide, and liquid dish soap in a bowl until it forms a soupy paste. 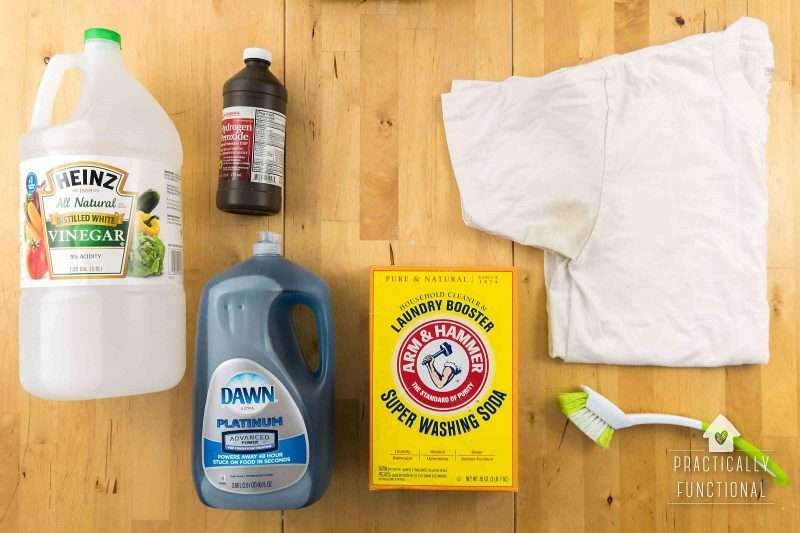 Hydrogen peroxide is a natural whitening agent, the dish soap will help cut any grease or residue on the stain, and the Super Washing Soda will lift it right up and out of the fabric. 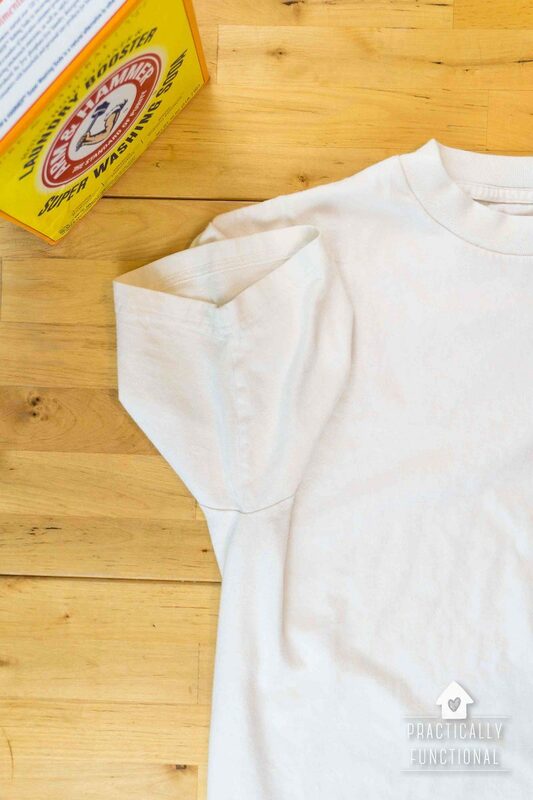 Lay your shirt out on a clean towel and apply the paste to the stain, making sure to cover the entire area. Gently scrub the area with a scrub brush to really get the mixture into the fabric of the shirt. The point here is just to work the paste into the fabric; the stain isn’t going to come out at this point, so don’t work too hard! 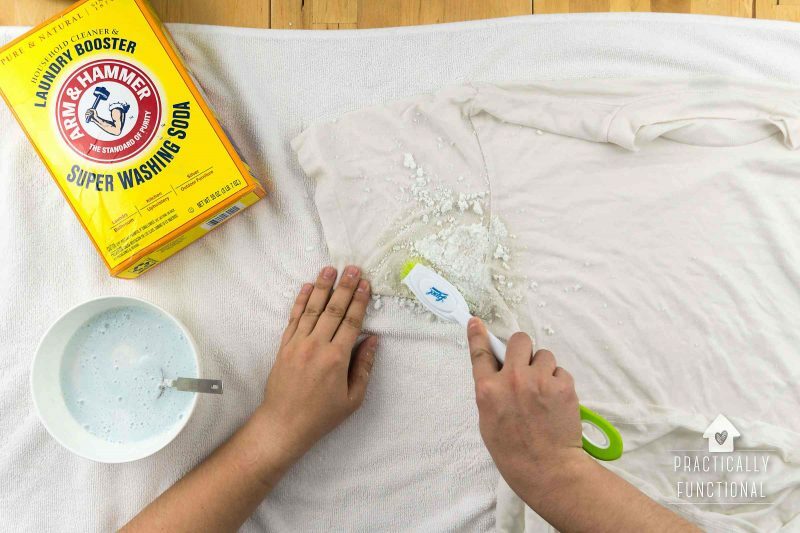 If the paste soaks into the shirt as you’re scrubbing, that’s fine! When you’re done scrubbing, apply a little more paste to fully cover the stained area, then set the shirt aside. Let the paste soak into the shirt for ten minutes. While the paste soaks into the shirt, mix up another batch of the same solution of Super Washing Soda, hydrogen peroxide, and dish soap in a large tub of water. Make sure everything is well dissolved in the water. Once the paste has soaked into your shirt for ten minutes, dump your shirt (paste and all!) into the tub of water with the dissolved cleaning solution and leave it there to soak. It can soak for an hour or up to overnight. 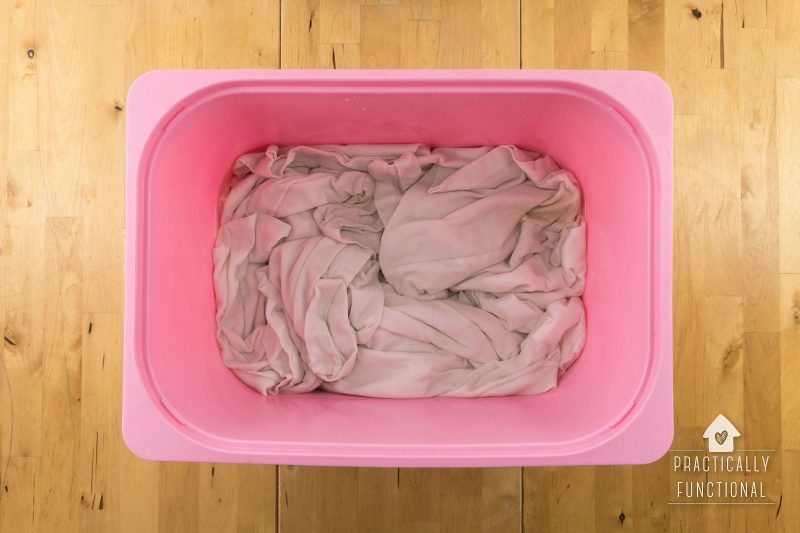 If you’re cleaning a bunch of shirts at once, you can soak them all together in the same tub. Once the shirts are done soaking, gently squeeze the liquid out of the shirts so that they aren’t dripping wet. Next, soak your shirts in a 1:4 vinegar to warm water solution. Again, you can soak a bunch of shirts at the same time if you want; just make sure that you keep the 1 C vinegar to 4 C warm water ratio. The vinegar helps to penetrate the stain and loosen any residue and grease, plus it will help kill any lingering odors. Leave the shirts soaking for at least half an hour. The last step is to toss all of your shirts into your washing machine and clean them on a regular cycle. If you want to add an extra boost to your laundry, add 1/2 C of Super Washing Soda along with your regular detergent. Dry your shirts like normal, and you’re done! (Double check to make sure all of the paste is gone from the shirts before you dry them, just in case!) 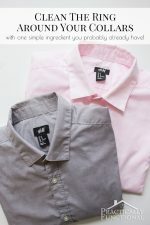 Your shirts will be clean, fresh, and looking brand new again! His shirts haven’t been this white since we first bought them! By the way, the yellow sweat stains in the armpits of your shirts aren’t actually caused by sweat! The stains are a reaction to the aluminum in your antiperspirant. 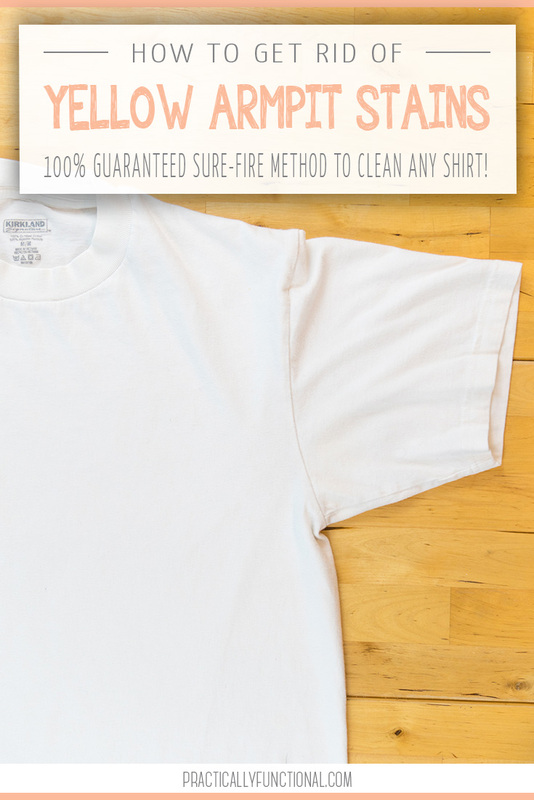 So this recipe works GREAT if you want to clean up the sweat stains on your shirts, but if you want to prevent them from coming back once your shirts are clean, switch to a deodorant without aluminum in it. 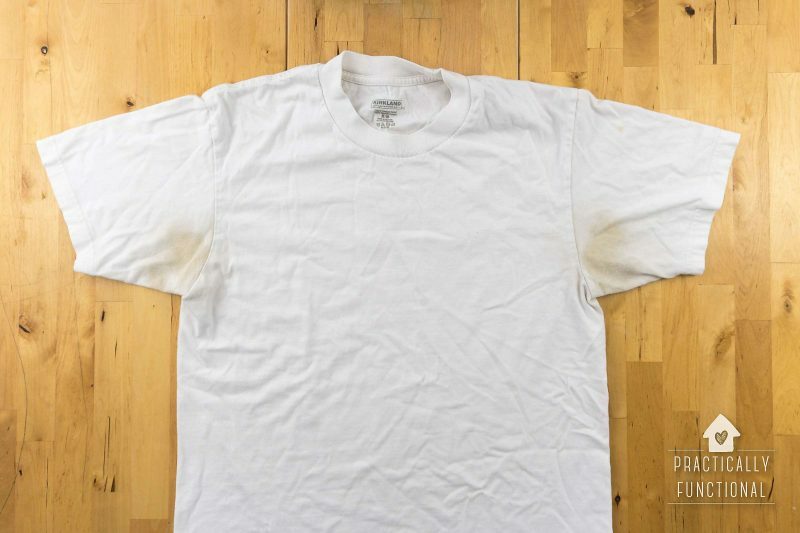 Pro Tip: We mostly notice yellow sweat stains on white or light colored clothing, but it happens on dark shirts too! 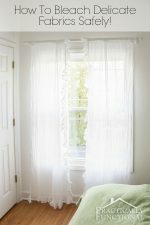 This recipe is totally safe for dark shirts, but I recommend cleaning your light shirts and dark shirts in two separate batches just in case some color escapes while you’re soaking them. 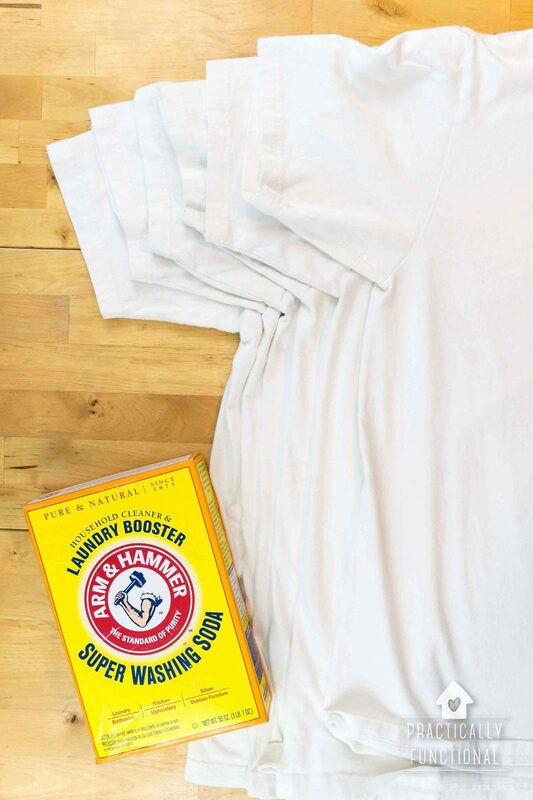 Another Pro Tip: Add ½ cup of ARM & HAMMER™ Super Washing Soda to all your laundry loads to boost your detergent performance! Yup, the Ingredients list tells you exactly how much to use of each! So like probably every other white loving lady I was searching the Internet for a solution on how to remove the yellow sweat stains from my white clothes. The perfect white tee (dress shirt, Sweatshirt) is no easy feat, white is a tricky color and it can cost serious money! So throwing out my whites was NOT an option! It worked! Happy dance and crowning glory for Jessi! I have tried many things before, I stank up my appartment with vinegar, I dumped buckets of oxi directly on the stains, etc. nothing worked! This combination for removing yellow sweat stains from underam pits is genuis. Combining Dish washing liquid (I used a clear one), hydrogen peroxide 3% and washing soda (I live in Germany, so I used another brand) ist the answer! Look no further! I would even say you could skip the vinegar afterwards…but my clothes were “only” yellow stained and had no stench attached. I will brush in the mixture before the next wash and that should fix it. The mixture was enough for 10 generously treated ladies items. I washed afterwards on 30 degrees celsius, mixed setting, extra rinse cycle and dumped in 1/4 cup washing soda along with the detergent for extra oomph. BTW I am now sitching to Arm and Hammer “Fresh” deodorant on days when wearing white tops. So if yellow stains are not caused by the urea in our sweat, then what causes ring around the collar? I do not apply antiperspirant to the back of my neck, lol!